Using ongoing, real world conflicts in videogames is in poor taste and unnecessarily controversial, says Operation Flashpoint's creative director. 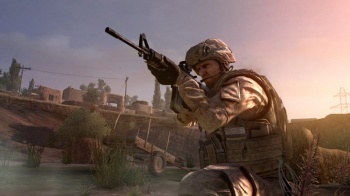 Sion Lenton, the creative director for Operation Flashpoint: Red River, says that he has no problem playing safe when it comes to using real world conflicts for videogames by side-stepping the entire issue. Lenton said that at no point had Codemasters considered using a real conflict as the setting for Red River, adding that it was deliberately avoiding that controversy by sticking with fiction. Moreover, his personal view was that to set a game in an ongoing conflict was in poor taste. He related the story of a nephew of one of the women in the office, who had been killed by an improvised explosive device. Hearing news like that, he said, made him feel very uncomfortable about the thought of setting a game in an ongoing conflict. It's not hard to understand why developers might steer away from using actual, current wars; the chances of someone on the team having suffered a very real and very recent loss - as happened with Lenton's co-worker - are significantly higher, and that's a difficult subject to broach at the best of times, let alone when you're making a game about it. All the same, the issue seems not to be that developers shouldn't be making games about war - dozens of war games come out every year and hardly anyone bats an eyelid - but that they should be so indelicate as to be specific about where that war is taking place and who it's against. Operation Flashpoint: Red River comes out for PC, PS3 and Xbox 360 next spring.